A start up business will normally rent office space to provide flexibility for growth and to reduce the amount of capital investment needed to purchase a property. The business plan financial projection will therefore need to include a projection of the office rent expense for the next five years. Obviously the major driver for office rent is the number of people working in the business (the headcount). The rent expense calculation is carried out simply by starting with the headcount and multiplying this by the amount of space needed per person to give an estimated amount of office space needed for the business. The total space requirement is then multiplied by the average cost per square foot in the business location, to give an estimated rent expense for the period. This rent expense calculator allows a business to input details of the headcount, average space per employee, and the monthly rent cost per square foot, and calculates the rent expense over the five year term of the business plan financial projection. Enter the headcount The headcount is the number of employees the business has at the office premises. The value can be obtained from the headcount calculator used to calculate staff costs. Unless the renting of space is entirely flexible, allow for the maximum number of employees which the building needs to accommodate during the accounting period. Enter the average space needed for each employee. Enter the average number of square feet needed for each employee. This should include an allowance for the common shared areas of the building. The rent expense calculator works out the total space needed by the business. Enter the rent cost per square foot per month The average monthly rent cost per square foot is entered. This cost will depend on the area and type of building occupied by the business, but an estimate should be available from a local agent. 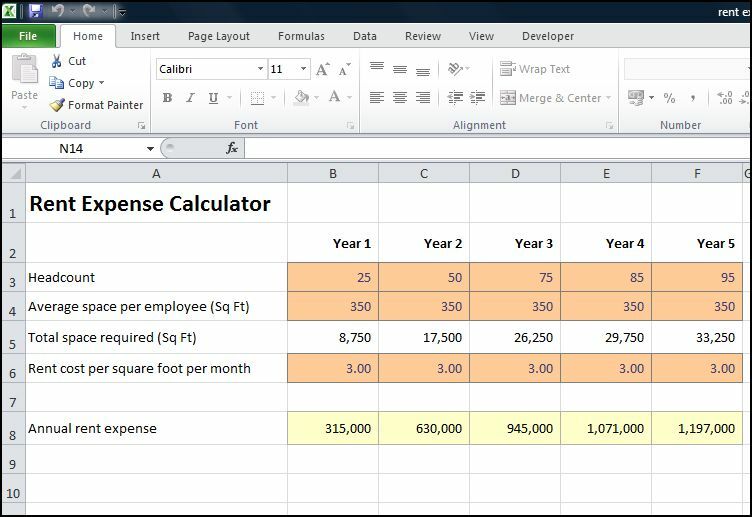 The rent expense calculator works out the rent expense for each of the next five years for the business plan financial projections. The rent expense spreadsheet is available for download in Excel format by following the link below. Users use this business rent expense calculator at their own risk. We make no warranty or representation as to its accuracy and we are covered by the terms of our legal disclaimer, which you are deemed to have read. This is an example of a office space rent template that you might use. It is purely illustrative. This is not intended to reflect general standards or targets for any particular company or sector. If you do spot a mistake in the rental expense calculator, please let us know and we will try to fix it.